The beauty of SEO, and the reason why many consider it a combination of an art form and science, is that it has an ever-changing landscape. Since the moment it became a recognized form of marketing, boosting search engine rankings has become a topic of discussion. There are numerous elements that influence search engine result pages (SERPs), although many argue that these rankings revolve around link building. Link building is the process of getting other sites to link back and direct traffic to your own. Link building has always been regarded as an effective, yet time-consuming strategy that can be the source of great success for your website. And, thanks to platforms such as The HOTH, you can now use efficient link building techniques to generate backlinks that boost your rankings. When it comes to SEO link building services, you have a lot of different solutions and web sites fighting for your business. One of these services is “The Hoth”, which specializes in SEO link building strategies through article spinning, using web 2.0 directories and link wheels. I first heard about the company when they were featured on ShoeMoney’s Free Shirt Friday. Since I’m always on the look out for new companies and what’s hot in the world of SEO and link building, I got in touch with TheHoth.com and setup a test campaign to see how they work. This review has been a long time coming. I’ve been a Hoth user for a good number of months, and first talked about the service late last year. I’ve used about 5 or 6 different packages on sites, and always seen a positive result. However, those results were always blurred slightly as I was also doing other things to said sites. When it came to writing my Hoth review though, I used a site that had previously had zero backlinks built to it, aside from via social media shares on Twitter and Pinterest. For those who don’t now, The Hoth is a backlink service that will build free web properties on your behalf, then add links to your website(s) from those properties. They will then send social links, bookmarks, and high powered blog network links to those properties, in a tiered linking fashion. This is the exact kind of linking that top SEOs like Alex Becker, Stephen Floyd, Matthew Woodward, and many more talk about. It’s the best way to (artificially) build links to your site, and the most natural looking. Overall, it takes about one month for The Hoth to get this whole package ready, and it could be anywhere from 2-6 weeks for you to realize the links are working. That’s why you can check out my results below, and have a little faith. After placing an order with The Hoth, they will get to work on using your requested urls and keywords to build a unique link plan for you. Once completed, you will receive a link report like the one below. I have blurred out the exact keywords and urls built for the campaign, but you will get the idea. The report breaks down all keywords, articles, web 2.0 and images used for your cycle of backlinks and bookmarks. Google have been pushing the mantra that relevance is the new PR for some time now. In layman’s terms, this means that the more RELEVANT blogs, websites, and forums that link to you, the better those links are. You don’t want to go out there and spam your site with links from all over the web. 10-20 relevant, high quality links is going to do more for your site than 1,000 irrelevant ones. 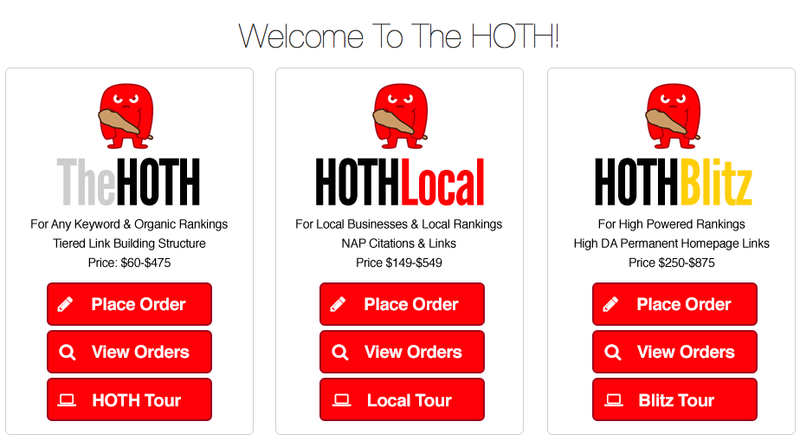 With The Hoth, they build relevant web 2.0 properties for you, load content onto them, give you the login details in case you need to change the links later, and then build even more relevant links to THOSE properties. Tiered link building like this works because each layer of links gets its own set of relevant backlinks in turn. This means that although you might only get a handful of links pointing to your site, those links will be powerful. Because only the top tier points to your site, it doesn’t end up with a low quality, suspicious looking backlink profile. Imagine if your site went from 0 links, to 50 links in a day. How odd would that look to Google? Wouldn’t it be better to build 5+ links every month, and have those links slowly dripped with links of their own? You bet it would, because that’s exactly how natural linking occurs. I write something good, my friends link to it, their friends link to them, people bookmark and share those links, and Google thinks “Wow..Dom’s article is probably quite good then”. While the content I had put on my web 2.0 blogs was never going to win any prizes, it was written to a pretty high standard, and was unique. This is precisely the kind of content that you want to be getting links from. I’ve talked about my results a little bit before, so I’ll do a recap here, and then show you my latest set of results. Check out more about their service inside Thehoth.com . This is essential from what ever service you choose to go with as you have to make sure there is some type of support. By the way, The Hoth actually has one of the better support teams that I’ve encountered as I e-mailed them with some questions and on multiple occasions they responded within 24 hours, exe cent from their part ! I managed to increase the traffic to one of my affiliate sites by 500% without adding any new content. This was done with 2 Hoth packages and some weak PBN links. I sent two of the lowest priced packages to a client’s site (with their permission!) and got their main money keyword to page 1 of Google. The client has barely touched the site since I built it for them and yet they have a page 1 ranking for a money keyword. As of writing this post, they are in position 6. I will go into more details about this one below, but in a nutshell, two Hoth Blitz packages got great results, and one article moved from position 37 to 7 for a buying “best of” keyword. Shaving Site Again – From Position 10 to Position 5 in Three weeks. I had my shaving site “stuck” on position 10 for two keywords for weeks and weeks and weeks. 1 Hoth Blitz package moved it up to position 5 and close to the coveted top 3 position in fewer than 3 weeks. As mentioned above, I wanted a proper “pure” case study to show you, so I used YourOwnGymZone.com. This is a site that has been involved in my “dual site case study” for a while, but until now had no links built to it. Well OK I guess it had 1 link built to it from this very site, but nothing relevant. Sometime in early March, I decided to test Hoth Blitz on it. The Blitz version of their service is slightly different from their standard package, which is why I was curious to test it. In this package, they simply place links from high quality sites directly to the URL’s and keywords you tell them to. This differs from the standard pack, because 1.) You can get the links immediately if you wish and 2.) The links are placed on existing properties rather than on ones built for you. They are fast and powerful. Hence the name “Blitz”. While this is a bit like some of those low-quality Fiverr gigs you see out there, the difference is that they are placed on relevant, high quality sites, that look just like standard PBN sites. They are placed on the homepage in the sidebar, but ONLY the homepage. These are not lower quality “sitewide” links. Get all your social media accounts (Facebook, Twitter, Tumblr, Pinterest, LinkedIn, Stumbleupon, Etc) and build 1 link per day on each. Example: Post a link to an article on Twitter, then on Pinterest, etc. Make sure you build the followers on all your social accounts too. Do that for 1 week. Then go looking for link opportunities: Guest posts, paid posts, sponsored posts. You want to aim to buy/do 1 – 5 of these per month. Now start a Platinum (Filipino writing), you can do a “Mini“ or “Results” depending on your budget. But $250 for the platinum service is incredible. Get one of these every other month. Repeat this and you’ll start growing your sites rank almost instantly. Social media accounts all posting links. Paid Facebook advertising to speed up audience growth, lots of work on Google + and one to two links built on each profile per day. I then built these accounts for 3 weeks while using The Hoth mini with english written content. Then purchase The Hoth Platinum package with English content. You can get the results package if you want. I buy one of these every 1 – 3 months. Private Blog Network links – I get 1 PBN with 5 – 10 sites and I use them to link to my money site. Search for every guest post and sponsored post opportunity in my own niche and try to get around 5 to 10. Tip: Make sure you have seriously varied anchor text, things like click here, here, there and naked URLs (Example: http://012345.com or 012345.com) do this on both low and high quality campaigns to remain penguin safe. Besides featuring a solid product and effective methods that will prevent any penalties, The HOTH also offers a stellar, U.S.-based customer support team that can help you via chat or phone five days of the week. The link building industry is always associated with faceless companies and communication barriers that are almost impossible to overcome, and The HOTH prides itself in providing transparent support that delights their customers, rather than causing an additional headache. Is It Worth You Buying? Were these rankings worth $500? Well, considering I started playing around with this site back in October 2014 and had little positive movement, then was able to get fantastic results in just 6 weeks? Yes. Plus, once a few more of these keywords reach page 1 and more traffic comes in, I’ll be able to start tweaking the site and getting the money back quickly. Worst case scenario, I can sell it for a decent price too. So considering that The Hoth Blitz costs $250, how does it compare with its competitors? $200-300 is how much some PBN services cost, and I would imagine they get similar results. If you don’t want to wait for someone like Jon Haver or Glen Allsopp to open up their service, Blitz is a good option. All three services are great and I’d say on a par with one another. The lower priced regular Hoth packs (starting at $60) are also worth using, as two of these packs got one of my customers to position 6 for a keyword, although it did take several months. I used Blitz on an aged site that had social shares. I wouldn’t recommend using it right off the bat on a brand new site. That said, I WOULD recommend one of the regular Hoth packs for a new site, as the links are dripped slowly and look more natural. If you’re unsure..start with a normal pack (any price is fine) and then use Blitz for a couple of months after that. The main goal of The HOTH is to build links in a natural manner, in order to avoid raising any red flags or being subjected to any penalization. Racking up backlinks too quickly, creating reciprocal links, and those that come from less-than-trusty sources can end up hurting your ranking. While I can personally say that I recommend The Hoth, I will prefer to build PBNs and send those links to my sites. However, that takes time and effort, and with a Hoth pack, I can build a nice layer of high quality relevant links on autopilot. In future I’ll probably build one or two Hoth packs in conjunction with high quality PBN links and good social shares. For those of you who don’t know how to build PBNs or are wary of using them, I’d definitely recommend checking out The Hoth. When it comes to complete link building solutions, The HOTH offers one of the most effective and safest ways to build links consistently and efficiently. Its simple, yet effective methods are built to provide results while following search engine-set regulations. Thanks to its extremely intricate link building methods, reasonable price tag, and great support team, The HOTH gets our seal of approval as one of the best link building platforms available today.